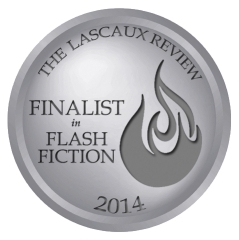 Welcome to the third annual Lascaux Flash Fiction Contest! The first thing you’ll notice is our name change. We’re calling it “Lascaux 250” to reflect the length of entries as well as to differentiate it from a 1000-word flash contest we’ll conduct next. 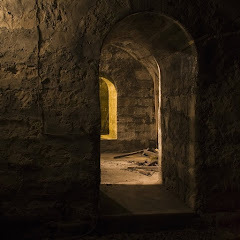 The site URL will stay the same this year, but will change to www.lascaux250.com next year. We’ve also made changes to the award. First, there’s a mandatory $4 entry fee, $2 of which goes to the prize fund. Thus if we should get the same number of entries as last year—283—the prize will be $566. The more entries, the larger the amount. It therefore pays to recruit your friends. The minimum amount awarded will be $250. So what happens to the other $2? First of all, it’s not $2, it’s $.81, after credit card and processing fees are subtracted. We’ll use this money to fund various programs, including other contests, awards, and (we hope, eventually) a college scholarship. Everyone who works for Lascaux is an unpaid volunteer. Another change this year is the option to nominate someone in the publishing community for an industry recognition award. The nominee can be a publishing professional of any kind, someone you think deserves recognition for his or her advocacy for writers. There’s a box to fill out on the Submittable form. It’s optional. Compose a work of fiction, maximum length 250 words. The prompt below is for inspiration only; entries will not be judged on how well they relate to it. Title and byline are not included in the word count. Contestants may enter more than once. 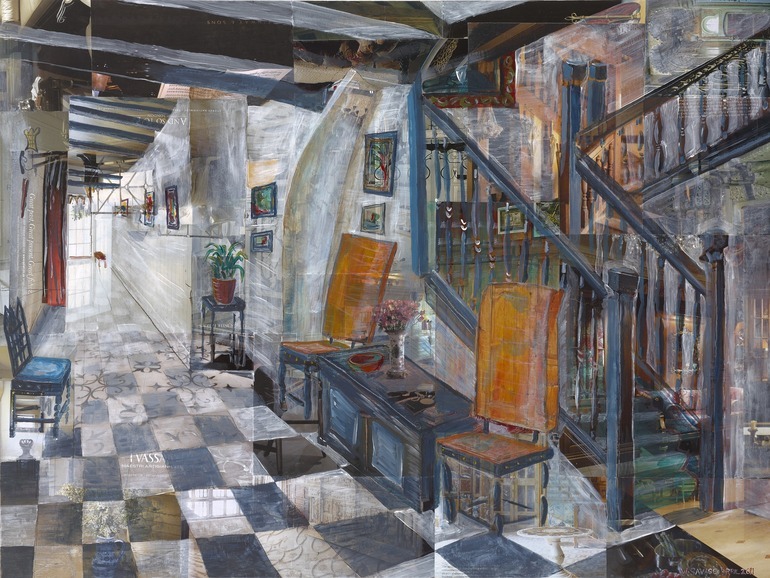 "East Bergholt Interior, Suffolk," collage, by William Savage, 2013. Used with permission. Story begins, single spaced, with a blank line between paragraphs, no indents, and no unconventional formatting. We’ll post entries on this site in the order they arrive. Contest participants grant Lascaux the right to publish and archive their submissions. Authors retain copyright of their work. 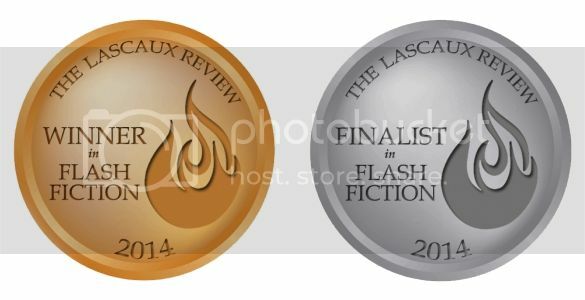 The staff of The Lascaux Review will collectively select finalists and a winner, all of whom will be announced simultaneously as soon as decisions are made (generally within a week after the deadline). The winner receives a cash prize of $2 for every paid entry. The winning entry will be published in the 2015 Lascaux Prize Anthology and the winner will receive two copies of the print edition. We use the word count function in Microsoft Word. If it says you’re over, you’re over, regardless of what other word counts may tell you. Some contestants try to shoehorn extra words in by combining them, e.g., “Maryhad alittle lamb, its fleece waswhite as snow,” and by taking extraordinary liberties with em-dashes and ellipses points. These tactics amuse us, thank you. We’ll share the merriment by publishing exactly what you submit. Thanks for the question. I added the sentence "Contestants may enter more than once." The rationale is, the more money raised, the bigger the prize and the sooner we solve the world's problems with the $.81 left over. Having said that, be judicious about the number of pieces you enter; if your best doesn't win, it's unlikely your fifth best will either. As dear old Sherlock would say - The Game Is On! When I do a word count, do I count all punctuation marks? What about spaces between words? After typing in the story title & author name, do we repeat the story title and author name again above the actual submission? All these word count questions are starting to worry me. Word says my story is exactly 250. If for some reason it goes over will you email for the opportunity to resubmit? Yes, I will email you if you're over, and you'll be given an opportunity to fix it. Please format your entry as you would any other, with title and author above the story. The number 250 applies to the story alone, not to title, author, or anything else. Thank you and keep up the good job! Bill, the stories are posted on the main site in the order they are received. If you change "First, there’s a mandatory $4 entry fee. For every entry, we’ll add $2 to the prize money." To: First, there’s a mandatory $4 entry fee, $2 of which goes to the prize fund, people won't interpret it to mean for every $4 we collect, we'll add $2 (for a total of $6). Never let it be said I failed to take the advice of the world's most famous editor. Thanks Evil, I changed the text. What if I forgot to format it correctly? Do I get a second chance to reformat? Anon 3:40: Sure, just tell us at lascauxreview at gmail dot com what you want us to change. Anyone else having trouble submitting? When I click "Enter a Story in the Lascaux 250 Contest" it takes me to a page that lists four things to which I can submit, but not the 250 contest. Any idea? Thanks! The Lascaux 250 is currently not open. This is a post from before. The only things that are open are the four items you mention are listed. Check back in the Spring. We are still firming up the calendar for when 250 will be taking place. Thanks for wanting to participate!